The long-lasting impacts of last year's Atlantic hurricane season makes the arrival of this year's storm season feel unsettlingly abrupt. The 2018 Atlantic hurricane season officially began on June 1, but it really started with the formation of Subtropical Storm Alberto back on May 25. You may have heard of it referred to as a "season of suspense" on The Weather Channel, which is angering on exactly eight different levels. Here's a hype-free rundown of what you can expect this season and what you need to know to stay informed. The traditional dates of hurricane season follows tropical cyclone climatology. The most likely time to see tropical cyclones in the Atlantic Ocean is between June 1 and November 30, but it's not unheard of to see storms form outside of that time frame. The most likely time to see some sort of tropical activity in the Atlantic—the peak of the season—occurs during the second week of September. This is when the ocean's warmth and favorable atmospheric factors like high moisture, low winds, and regular tropical waves, are usually most abundant. Storms tend to form closer to the United States and Caribbean early in the season and activity slowly shifts east toward Africa in August and September as tropical waves take hold. Of course, it doesn't take much to see an impactful storm early or late in the season. Tropical Storm Allison formed in early June 2001 and served as the benchmark for immense tropical flooding until last year's Hurricane Harvey. Hurricane Sandy didn't make landfall until a few days before Halloween. The cliché goes that it only takes one storm to make a mess of things, and the general lack of storms or long quiet periods doesn't necessarily mean that coastal regions are out of the woods. The Atlantic's first named storm of the 1992 season didn't form until the middle of August. It was Hurricane Andrew. What's in a name? A tropical cyclone refers to any low-pressure system that has tropical characteristics—a warm-core low-pressure system powered by thunderstorms tightly packed around a closed center of circulation at the surface. A tropical depression, tropical storm, and hurricane are all tropical cyclones. Those three names are assigned based on the maximum sustained winds in a storm. A tropical cyclone with sustained winds of less than 39 MPH is a tropical depression. Winds between 39 and 73 MPH make a tropical storm. Winds greater than 74 MPH are hurricane strength. The Saffir-Simpson Hurricane Wind Scale, a real mouthful to type, does a decent job in quickly conveying the severity of a hurricane's winds. Over the years, though, it's turned into a pox on threat communication ahead of a landfalling storm. It's seared into our minds to focus on a phrase like "category three hurricane" rather than "enormous storm surge" or "record flooding from heavy rain." Thankfully, meteorologists and reporters are getting better at talking about hazards like storm surge and freshwater flooding and not putting so much focus solely on wind speeds. The name of a particularly destructive or deadly storm and replaced with a new, lazily-chosen name of the same gender and letter to take its place. The list of names in 2018 was last used in 2012 and features a newcomer, "Sara," filling in for now-retired Sandy. The replacement names are sometimes so similar to the retired name that it makes you wonder why they even bothered; most notably, Katrina was replaced with Katia and Rita replaced with Rina. In the unlikely event that this hurricane season decides to go on steroids and we exhaust the usable parts of the English alphabet (we skip Q, U, X, Y, and Z for lack of expendable names), protocol states that we switch to the Greek alphabet after the "W" storm. This only happened during the hyperactive 2005 hurricane season, which saw 28 named storms—the 2005 hurricane season ended with the dissipation of Tropical Storm Zeta, named after the sixth Greek letter, on January 6 of the following year. Storms can and do form outside of our scheduled hurricane season. This is the fourth year in a row (!!) that we've seen a named storm form in May. Subtropical Storm Alberto formed in the western Caribbean on May 25 and made landfall on the Florida Panhandle on May 29. The storm managed to survive for several days over land, looking more impressive over Indiana than it ever did over the Gulf of Mexico, before finally losing its structure over the famously-tropical state of Michigan. A subtropical cyclone is one that has both tropical and extratropical characteristics. A subtropical storm gets some of its energy from upper-level winds, its thunderstorms and wind field are displaced from the center, and it's not fully warm throughout the storm. It's not fully tropical, so it's subtropical. (Clever!) Subtropical and tropical systems are close enough to one another that they deserve the same treatment despite the different structure. Despite its less-than-threatening title, Alberto left flooding in its wake (especially in western North Carolina) and took several lives through rip currents and a downed tree. Alberto counts toward the season's total number of storms, so the next named storm will be Beryl. Most forecasts for this season call for average or slightly above-average hurricane activity. We're currently in an ENSO-Neutral pattern in the eastern equatorial Pacific Ocean, meaning that there's neither an El Niño nor a La Niña present. NOAA expects these neutral conditions to persist through most of the hurricane season. El Niño (abnormally warm water) and La Niña (abnormally cool water) can each affect tropical activity in the Atlantic by slowing it down (Niño) or allowing more storms to form (Niña). Without either of those conditions present, it looks like the water around the equator in the eastern Pacific Ocean shouldn't play much of a role in the Atlantic's tropical activity. So what could? It'll be interesting to see how much the water here in the Atlantic basin serves to hurt tropical activity later this season. NOAA's current analysis of water temperature anomalies in the tropical Atlantic show waters a degree or two Celsius below normal. This could change as we head deeper into the summer months, but cooler-than-normal water could slow down tropical activity and make intensification harder for storms that do form. 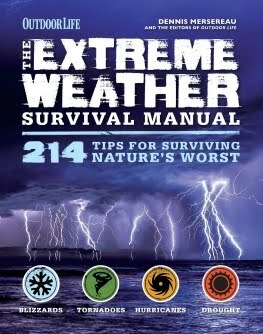 It's important to qualify any discussion of seasonal forecasts with the fact that every situation is unique and relies on so many individual factors that it's hard to tell beforehand what's going to happen. We could have nothing but a string of sloppy, weak storms this year or go the entire year and see two storms that take every opportunity they get to thrive. It's hard to tell in advance. The National Hurricane Center has the sole responsibility of issuing forecasts for storms in the Atlantic Ocean. They issue so many different forecasts and graphics and alerts that it can get confusing even for a weather geek. I often make my own maps when I write about storms and post about them on social media. My maps are very similar to the National Hurricane Center's. For these examples, though, I'll post the NHC's own graphics. 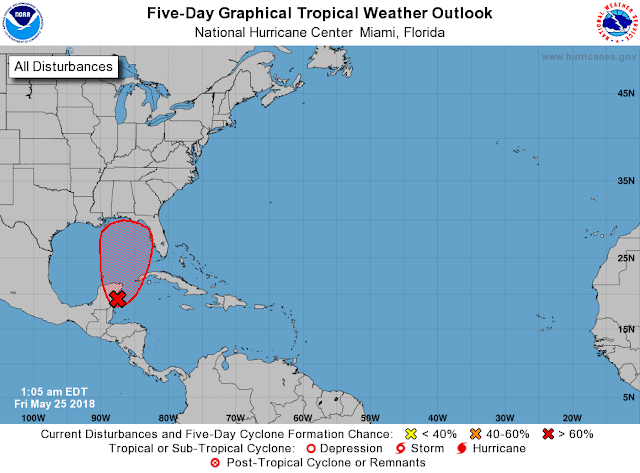 The NHC issues a tropical weather outlook four times a day explaining their thinking for tropical weather over the next five days. These forecasts are issued in terms of the probability of tropical cyclone formation. A < 30% chance is considered low, 40-60% chance is medium, and >70% is a high chance of tropical development. An advisory is an update on the storm that includes current conditions (position, wind, pressure) and a five-day forecast. Each advisory includes a public advisory, which is written and formatted in plain English, a forecast advisory containing technical details, a forecaster's discussion outlining the scientific justification for each forecast, and a whole suite of forecast graphics. The cone of uncertainty is the most common forecast graphic we see from the NHC. 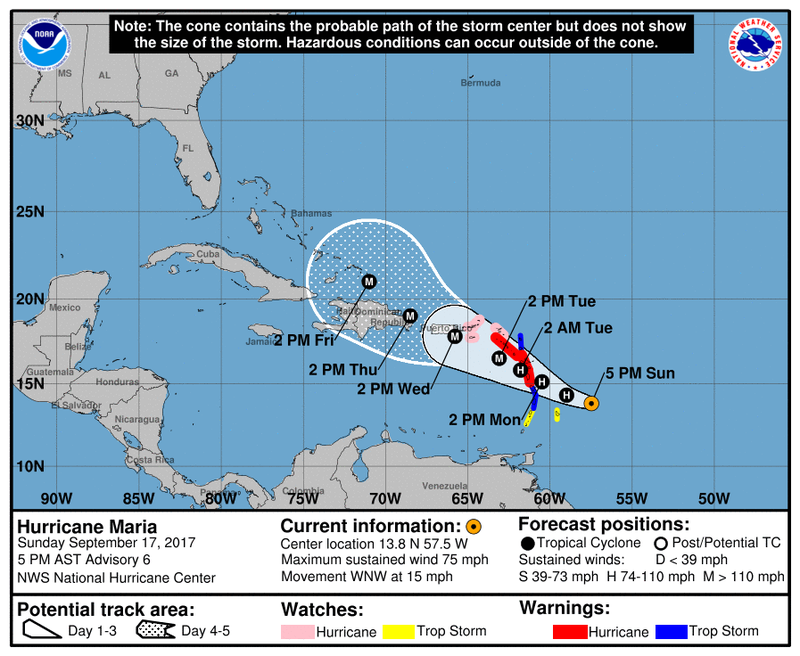 The cone of uncertainty is the margin of error in the agency's storm track forecasts. Historically, the center of a storm stays within that cone 66% of the time. Storms can and do venture outside of that cone, especially when it's weak or in a complex environment. The cone only applies to the center of a storm—the rain, wind, and storm surge can extend hundreds of miles away from the storm's center track. 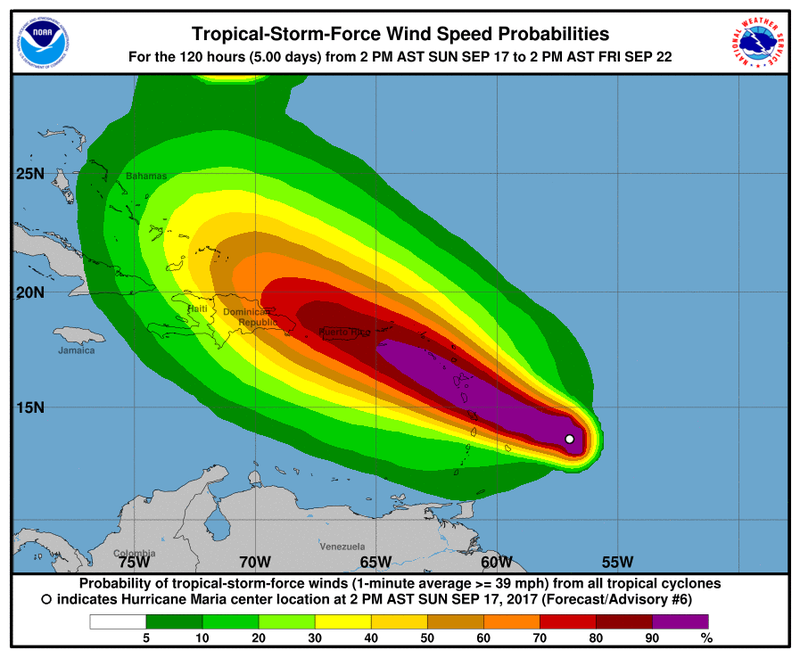 Wind speed probabilities show the chance of seeing tropical storm or hurricane force winds along the track of the storm. It's a good way to get a quick idea of who's at risk of seeing strong winds from a storm. 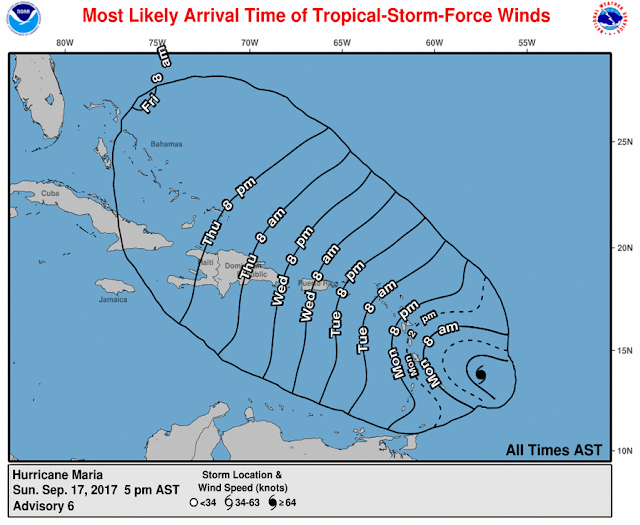 This differs from the cone of uncertainty as it incorporates the anticipated size of the storm's wind field at each point along its forecast track. Even a low probability of strong winds is relatively high. The most likely time of arrival for tropical storm force winds is a new graphic that helps you plan for when conditions will be too dangerous for travel or storm preparation. The potato-looking graphic shows when strong winds could arrive based on the storm's forecast size, track, and speed. The earliest reasonable time of arrival graphic shows the earliest you could expect strong winds if the storm sped up or grew in size. Watches and warnings are always tricky. A watch means that dangerous conditions are possible while a warning means that dangerous conditions are expected. A tropical storm or hurricane watch is issued 48 hours before the possible arrival of strong winds. A tropical storm or hurricane warning is issued 36 hours before the expected arrival of strong winds. Tropical storm and hurricane watches/warnings only apply to wind speeds. These alerts don't speak to the potential for storm surge, flooding, or tornadoes. A new product that started in 2017 was the addition of storm surge watches and warnings. A storm surge is sea water pushed inland by strong, persistent onshore winds. These new storm surge alerts are issued when a life-threatening storm surge is possible or expected at a particular location.